Linda Epstein over at TabletPc2 has published her first look at the Fujitsu LifeBook T2010, Fujitsu’s latest ultraportable “convertible” Tablet PC / Laptop (basically can convert back and forth between a Tablet PC and a laptop form factor) in the 12.1″ widescreen display range. 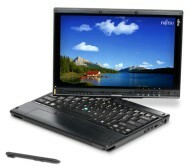 The T2010 is one of the first Tablet PCs in this range to include LED-backlit display as an option. The T2010 is based on Intel’s Santa Rosa platform and features either a U7500 (1.06GHz) or U7600 (1.2GHz) Ultra Low Voltage (ULV) Intel Core 2 Duo CPU and uses Intel’s GMA X3100 graphics chipset. It uses either a standard 2.5″ Serial ATA drive (60GB – 160GB) or a 32GB Solid State Drive (SSD). This is one of the first 12.1″ Tablet PC/laptops to offer the flash-based SSDs. While it does weigh in at only 3.5 pounds (with the standard battery), part of that is at the cost of an internal optical drive. First and foremost let me begin by saying that the Fujitsu Lifebook T2010 Tablet PC has the best indoor – outdoor display I have ever seen on a Tablet PC. You can clearly see the T2010 screen even in very bright sun. Adding to the accolades for this screen is that fact that there is no loss of brightness or clarity indoors, so you don’t have to compromise indoor quality to get outdoor visibility! This entry was posted in Fujitsu, Reviews, Tablets. Bookmark the permalink.